The Helene Zelazo Center is a UNIVERSITY OF WISCONSIN-MILWAUKEE (UWM) venue for performing arts. The building was dedicated in 1923 as the second home of Congregation Emanu El (which became CONGREGATION EMANU EL B’NE JESHURUN in 1927), a Jewish synagogue. The building was designed by Robert A. Messmer & Bros., a firm also responsible for the A.W. Rich Shoe Company on East Chicago Street in the Third Ward, the Atwater School in Shorewood, Milwaukee County buildings on Watertown Plank Road, and many private homes. The Neoclassical structure, which cost over $312,000, is located at 2419 E. Kenwood Boulevard. 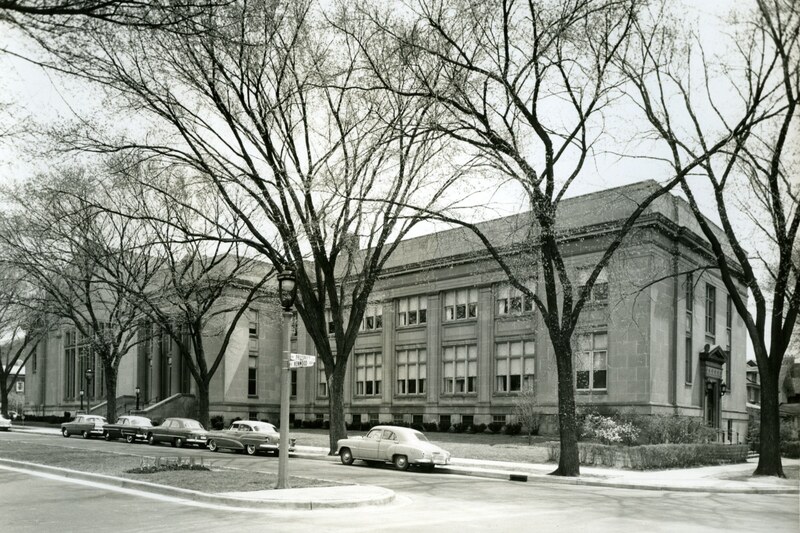 It was built with two floors and a basement, including a sanctuary and additional auditorium, the library, classrooms, a banquet hall, a kitchen, and board and other meeting rooms. The building was constructed with limestone and brick, featuring Ionic columns at the entrance. Its floors and stairs utilized marble and terrazzo. In 1931, based on a conception of Rabbi Joseph L. Baron, stained glass windows were installed. They were designed by Alexander C. Rinkskopf of Chicago and constructed by the Munich-based Larscheid-Van Treeck glass company. Each depicts Jewish symbols and values. During the late 1990s, when the congregation moved to Brown Deer, it made a controversial decision to sell the building to UWM. The transaction was completed in 2000, and the building was reconfigured for its present purpose. The main auditorium (Helen Bader Concert Hall), equipped with sound and light systems, currently seats 758, with a large stage and an orchestra pit. ^ “Proposed New Synagogue for Congregation Emanu-El,” printed brochure in Emanu-El Bne Jeshurun Records, Container 1, Folder 26, Jewish Museum Milwaukee Archives. ^ Board of Trustees Minutes, January 5, 1930, Congregation Emanu-El B’ne Jeshurun, in Emanu-El Bne Jeshurun Records, Container 8, Folder 16, Jewish Museum Milwaukee Archives. ^ Leon Cohen, “Art Form Developed for Churches Beautifies Area Jewish Institutions,” Wisconsin Jewish Chronicle, August 21, 1992, pp. 12-13. Fromstein, Ruth. In This Place: Congregation Emanu El B’ne Jeshurun’s First 150 Years. Bloomington, IN: Author-House, 2006. Gurda, John, One People, Many Paths: A History of Jewish Milwaukee. Milwaukee: Jewish Museum Milwaukee, 2009. Muchin, Andrew, and Amy Waldman. 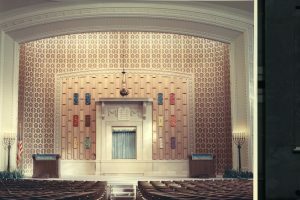 “Holy War: An East Side Synagogue in Jeopardy; Congregants in Dissension.” Milwaukee Magazine 25 (4) April 2000: 76-81, 135-140.